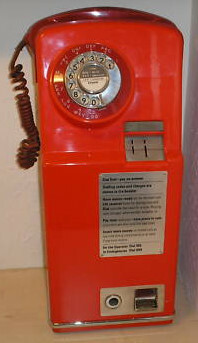 When the A and B button system was nearly 35 years old, subscriber trunk dialling (STD) was introduced in 1958 there arose the need for a coinbox system which could deal with the new periodic metering for both local and trunk calls.Before STD a local call had a fixed fee however long it was. In order to keep the coinbox mechanism as simple as possible so that capital and maintenance costs might be reduced, a post-payment system (known as pay-on-answer) was adopted; coins were cashed on insertion and not held in suspense. 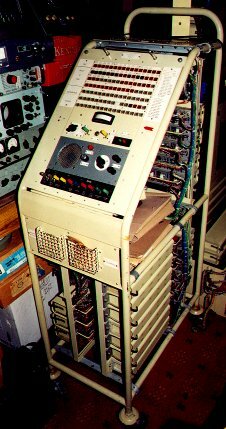 A complex piece of apparatus at the local telephone exchange, known as the coin-and-fee check (C and FC) relay-set, compares the meter signals from the call-charging equipment with the coin signals received from the coinbox. The C and FC unit controls the opening of the coinslots, gives the customer audible warning when his money has run out, and cuts off the call on expiry of a short period of grace. The coin telephone was connected by the usual pair of cables to the telephone exchange, but instead of going straight into the SUBs line equipment it went through an extra piece of equipment called the coin-and-fee check (C and FC) relay-set, this allowed not only dial pulses to be signalled from the payphone to the PSTN but also coin pulses when coins were inserted. Dial digits were sent as usual by breaking the line 1- 10 times for 1 - 0. You can see below this mechanism can send 1,2 or 5 pulses. The cam and the whole of the coin pulsing contacts are moved left to right depending on what coin is inserted so that the cam follows the appropriate metal shape. If the coin is pushed in further, it disappears into the slot and the coin hits the mask contact buffer and opens mask contact. The clock work arm then begins to fall. Now contact A opens - POEEJ says CP.ON3 initiates the full break at the end of a coin train. After 01-965 in Harlesden and 01-997 Perivale? both went TXE4a you didn't need the line break after a coin pulse. Following the 1st series of coin pulse(s), the system would wait with the audio bridge broken, then around the same time you'd expect to hear NU on a Strowger (1-2 seconds maybe? ), the audio would re-connect and that was that. Next time you coin pulsed, there would be no break in audio BUT if after the third pulse you did do a line break, you were back to square one with the break in audio restored following a pulse (or series of). I don't know why this was but thought it was a mistake at the time. Does anyone know if the line break after coin pulse security feature was restored with the introduction System -X? AT5716 required the dis after a coin pulse train. Later versions did not (60665 and 61486 for UAXs.) TXE 4 and later did their own thing. I am not aware of any POA boxes omitting the dis, but possibly a mechinism could be so adjusted. known about flashing a button through a resistor, they must have known about giving a flash disconnection as well! 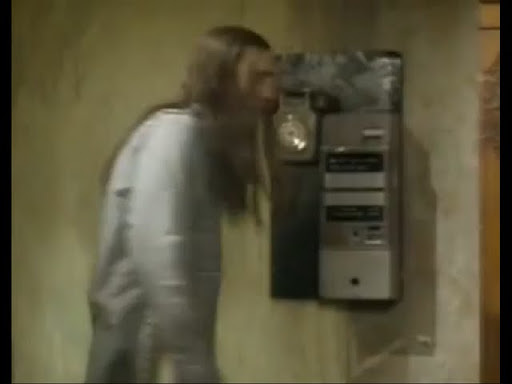 That wouldn't work on any Strowger that I've played with as there was another security feature in place that if a coin pulse was received before a charge pulse, as soon as the remote end answered and a charge pulse was received, the call would disconnect with the caller getting NU. I must see if this is the case next time I'm in a working museum as maybe this was just a London (director) thing? coins of the realm. 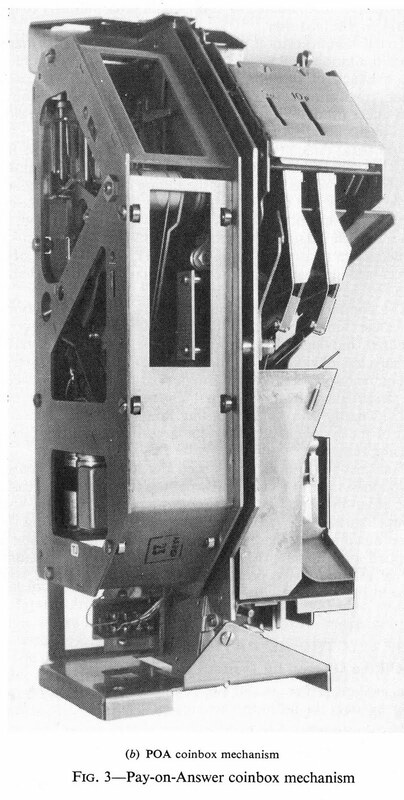 The combination of a complex relay-set in the telephone exchange and a coinbox mechanism containing several hundred moving parts is an obvious reliability hazard; perhaps less obvious are the difficulties of managing a system where the responsibility for the major parts is divided between the essentially separate internal and external maintenance staffs. The difficulty of attributing faults to the appropriate part of the system is probably the largest contributory factor causing recurrent call failure. 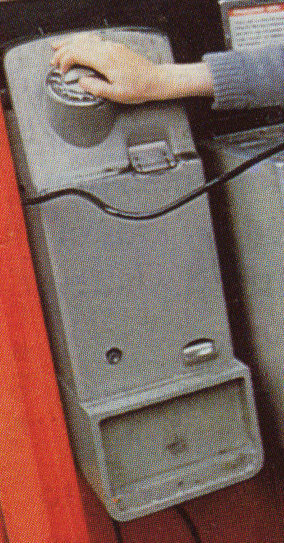 Full cash-boxes had always been a problem, both in rented payphones and in Public Call Offices. It is by no means trivial: a full cashbox generally causes coins to jam, often resulting in a visit by an engineer. Service can often be restored by shaking the coins down and clearing the jam ; but unless the cash-box is emptied immediately, the trouble will quickly recur. A number of attempts had been made to detect and report coin jams in POA boxes, with only limited success. I have little original information on this era of pay phones, but I am interested in them because I remember them and used them a lot. There is a good article in the Post office electrical engineers' Journal (POEEJ) Vol51 Part 4 Jan 1959 that is dedicated to STD. it can be found on page 343 called "The pay-on-answer Coin-Box System"
That describes both the box and exchange kit in good detail. There is also an article later on in the same journal vol 54 part 3 October 1961 on page 176 describing "a pay-on-answer coin-box for subscribers' installations"
Luckily Bob Freshwater's site has lots of great information on them.